Milan is Italy's fashion capital. If it has a predominant color, it is gray. This is not only because of the blocks of neoclassical stone buildings for which the city is celebrated, but it also due to its often-gray sky, which traps pollution. The city has ambitious plans to plant 3 million new trees by 2030, a move that experts say could offer relief from the city's muggy, sometimes tropical weather. Some ad-hoc projects have already contributed to environmental improvements. Architect Stefano Boeri's striking Vertical Forest residential towers aim to improve not only air quality but the quality of life for Milan residents. They were completed in 2014 and are near the Garibaldi train station. Boeri created a small island of greenery in the heart of Milan. Brimming from each of the balconies of his pair of high-rises are shrubs and trees. They absorb carbon dioxide and PM10 particles. These particles are a pollutant with links to respiratory ailments and cancer. "I think the theme of forestation is one of the big challenges that we have today. It is one of the most effective ways we have to fight climate change. It is like fighting the enemy on its own field," Boeri said. "It is effective and it is also democratic because everyone can plant trees." The U.N. climate summit recently took place in Poland. It urged cities and regions to help achieve the goals of the 2015 Paris agreement on curbing global warming. The goals include limiting the increase in the planet's temperature to 3.6 degrees Fahrenheit this century. Also, the World Economic Forum's global agenda council has put extending the tree canopy among its top urban initiatives. They recognize that small-scale changes can have a major impact on urban areas. This includes helping to lower city temperatures, creating more comfortable microclimates and mitigating air pollution. The program will boost the number of trees by 30 percent in the broader metropolitan area. Milan officials estimate it will absorb an additional 5 million tons of carbon dioxide a year - four-fifths of the total produced by Milan. The program will reduce harmful PM10 small particulates by 3,000 tons over a decade. Significantly, it would also reduce temperatures in the city by 2 degrees Celsius, according to officials. Boeri said the current green canopy of the Lombardy region's capital is just 7 percent of the urban area - well below northern European cities. For instance, Germany's Frankfurt is 21.5 percent while Amsterdam is at nearly 21 percent. The Lombardy region is closer to Paris at nearly 9 percent, according to the World Economic Forum's Green View Index. The French capital itself has been battling for years to fight rising air pollution. Damiano Di Simine is the scientific coordinator in Lombardy for the environmental group Legambiente. He said potentially the biggest impact of the green Milan project will be to lower temperature. It is a city where the nighttime temperature can be 10.8 degrees Fahrenheit higher than in the surrounding area. City statistics show that Milan endures 35 tropical nights a year. Milan gets very little wind to clear the pollutants that become blocked in by temperature inversions - when a layer of cool air is trapped by a layer of warmer air. That's because the city lies close to the Alps. Other new green spaces already inaugurated include Boeri's Library of Trees, near the Vertical forest, which includes 450 trees and 90,000 plants on nearly 10 hectares (24 acres). 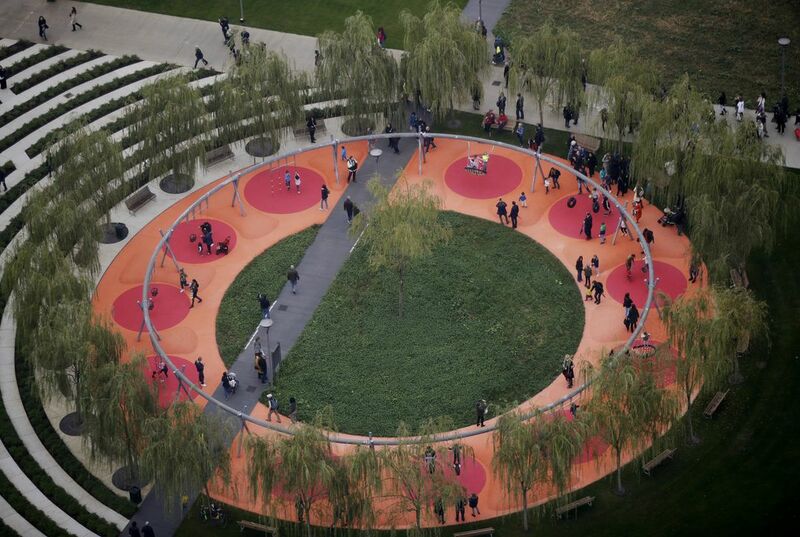 It features a children's playground and a dog park. The Fondazione Feltrinelli also plans to create a park of 3,300 square meters (35,520 sq. feet) near its new headquarters. It will be home to plantain, magnolia, cherry and pear trees. 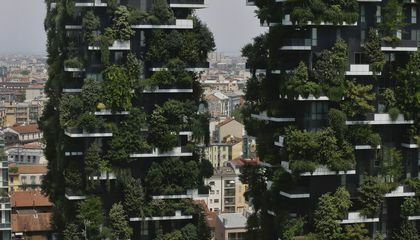 What other ways could Milan make their city more green? they could plant more trees. Also they can grow vines and just keep up with it. Or you can have a fertilizer to make it grow faster if there is a fertilizer that can do that. Plus they can maybe just spay paint it green to make it look cool. In order to make the city more green, they could boycott cars and fossil fuel wasting items. This would help to decrease pollution. A decrease in pollution is very important because we are just tearing down our own protective barrier, the Ozone Layer. If we keep tearing away at that, the seasons will be more extreme, and life will be harder to live. Global warming is the increase of the average temperature on Earth. We need to stop using fossil fuels because the higher the temperature, the harder life will be. This is why electric items should be boycotted.